Polish Traditions - Polish Christmas Eve (Wiglia) & Polish Easter & More!!! Traditional Easter celebrations in Poland are as old and elaborate as Christmas celebrations and they involve a lot of preparations. One week before Palm Sunday, housewives stopped baking bread through the fear that the bread they baked throughout the rest of the year would spoil. Not until the Holy Week did they start baking. In some parts they began to do so on Good Friday, in others- it was not permitted to bake anything at all that day. If any housewife violated this ban, the entire village would be in danger of a long drought, which could be repelled only by throwing the pots and guilty housewife into a pond. The celebration of Easter is preceded by Holy Week, which begins with Palm Sunday. Palm branches and twigs are indispensable accessories of the events of this day. They commemorate Christ’s triumphant entry into Jerusalem. After the festivities, palm leaves were used for magic rites, such as conjuring up storms and consecrating women at childbirth and sick domestic animals. The original palm branch is replaced by a willow or raspberry branch, and is decorated with ribbons, flowers, and leaves. It is believed that swallowing a willow catkin from a branch consecrated by a priest would bring health, and palm branch placed behind a holy image until the following year would bring the inhabitants luck. The church bells that had resounded from Palm Sunday onwards fell silent on Holy Thursday. Rattles and clappers took their place. Fires were lit at crossroads so that wayfarers and poor people could warm themselves. Meals were also placed at these spots so that these people could nourish themselves – and together with them the good spirits of the house. 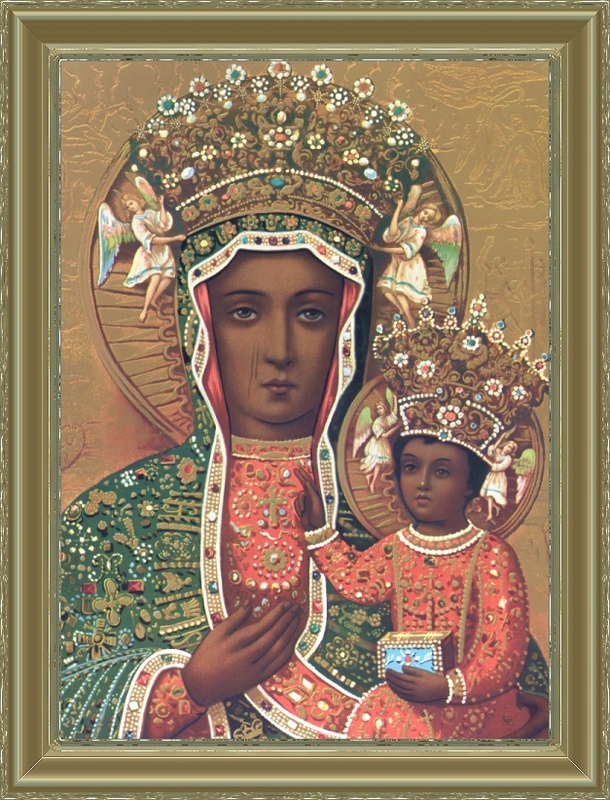 On the morning of Holy Thursday, the vestments are changed on the miraculous icon in the chapel of the Pauline monastery at Jasna Gora in Czestochowa. This is one of the most important sites of the religious cult of the Poles, and has been venerated as a national shrine since 14 th century. The next, Good Friday, marks the start of the vigil at symbolic tombs of Christ, which lasts until Holy Saturday. Visits are made to “tombs of Christ’. The adoration of the Good Friday tombs is called “the visitation of the tombs’. No animals could be slaughtered or bread baked, and mirrors covered over. The use of combs was not allowed, so Good Friday was a day of mourning. A special kind of bread was prepared for Easter Sunday, called “paska” . It was made of flour and yeast. The surface was spread with fat and decorated with a cross made of dough. Apart from cross of dough, it was decorated with flowers and birds. The tradition of preparing “paska” involved women. The master of the house was not permitted to take part of preparing the “paska”, otherwise his mustache would go gray and the dough would fail. On that day a “funeral of zur and herring” was organized. A clay pot with zur was shattered and a herring was hung on a branch as punishment “that for six weeks it had ruled over meat”. On the next day, Holy Saturday, services accompanied by processions are held to commemorate the Resurrection. Inside the churches, priests sprinkled holy water on small baskets brought by believers and filled with “paska”, cakes, eggs, horseradish, sausages, ham, salt, pepper, and tiny sugar lambs. The consecration of eggs refers to egg being an ancient symbol of life. The consecration of horseradish refers to the bitterness of the passion of Jesus which, on the day of resurrection, changed into joy and sweetness. The custom of coloring eggs for Easter is still observed. Eggs which are painted in one color are called “malowanki” or “kraszanki”. If patterns are etched with a pointed instrument on top of the paint, the eggs are then called “skrobanki” or “rysowanki”. 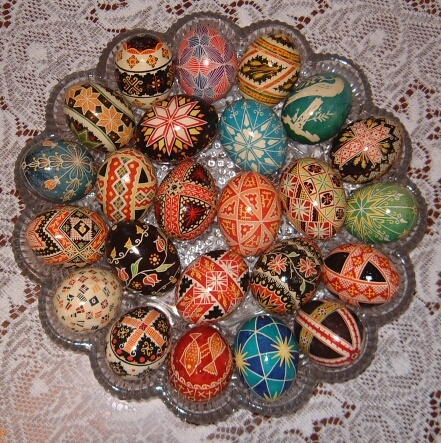 Those eggs decorated with the use of treated wax are called “pisanki”. Another technique involved gluing colored paper or shiny fabric on them. In old Poland, this resurrection service was an opportunity to identify witches, for witches were believed to enjoy eating sausage during sermons, still during Flaxt. It was also believed that a priest could see which of the women attending mass was a witch, but was not allowed to reveal his information. It was also believed that during Easter procession, a female collaborator of Satan was unable to go around the church three times, and had to leave the procession after the second circuit. After resurrection, gunshots were fired as an expression of joy. On Sunday morning, beautifully laid table is covered with colored eggs, cold meats, coils of sausages, ham, yeast cakes, pound cakes, poppy-seed cakes, and in the middle of it all, a lamb made of sugar, commemorating the resurrected Christ. No smoke was permitted; therefore no warm meals were served. Horseradish was mixed with beets, “cwikla”, traditionally present on polish Easter tables. Sharing a boiled egg with one’s relatives is a national tradition. A piece of egg with salt and pepper, consecrated by priest, is an inseparable accessory in the good wishes we extend to each other at Easter. Each member of the household received also a piece of the consecrated bread. When spread with horseradish, it was supposed to give protection against throat diseases and against illnesses and complaints. Cakes were very important ingredients of Easter breakfast: gigantic cakes called “baby”, as well as “mazurki” were prepared only for those occasion. The “baby” were either plain vanilla, steamed, saffron-flavored, grated with egg yolk, almond flavored, layered, chocolate-flavored, fluffy, lemon-flavored, bread-like, or many other different kinds. “Mazurek” is a flat cake, usually on a pastry or a wafer, covered with paste of nuts, almonds, cheese etc., colorfully iced and decorated with jam and nuts and raisins. On top of this, imaginative decorations were placed, such as eggs of icing; willow branches made of marzipan, chocolate flowers, and other delicacies. Artistic letters made of cream read “Hallelujah” – joy of the Resurrection. The list of possibilities making “mazurek” cake are endless, ranging from almond flavored, marzipan, chocolate, raisins, nuts and figs, poppy-seed, orange, crumbly with wine or vodka, apple, French-style, layered, and many others. On Easter Monday there is a very ancient Easter tradition called “Smingus-Dyngus” – custom of pouring water on one another. One week later, an interesting event takes place in Krakow. The hero of the festivity is “lajkonik” or a man disguised as Tatar, riding a peculiar kind of hobby horse. The custom dates back to the 17 th century. The legend says of an unexpected Tatar foray on the Krakow province in the 13 th century. A brave young raftsman, having gathered a group of companions, defeated the invaders and returned to town wearing the colorful outfit of a Tatar khan. During the Tatar attack, the legend then follows, a Tatar arrow struck in the throat a Krakow trumpeter, who from the spire of the church of the Holy Virgin tried to alarm citizens of the danger. Since that time, Krakow bugle-call, sounded every hour from the tower of the church, breaks abruptly. rural Polish Christmas time traditions. For Poles, Christmas Eve is a time of family gathering and reconciliation. It's also a night of magic: Animals are said to talk in a human voice and people have the power to tell the future. The belief was born with our ancestors who claimed that Dec. 24 was a day to mark the beginning of a new era. It was bolstered by sayings such as, "As goes Christmas Eve, goes the year." Hoping for a good 12 months, everyone was polite and generous to one another and forgave past grievances. When going to Christmas Eve midnight mass, girls would blindfold each other and touch fence pickets. A straight and smooth picket would portend a resourceful husband, while a crooked and rough one was an indication of a clumsy and awkward spouse. If a maiden wanted to learn about her future fiancé’s profession, she would go to a river, dip her hand in the water and pull out the first thing she touched. Wood meant a carpenter, iron-a blacksmith, leather-a shoemaker, etc. Before going to bed, she'd wash her face with water without drying it. She would hang the towel on the footboard of her bed. The boy who passed her the towel in her dream was to become her husband. From the small hours on Dec. 24, women were found cleaning and sweeping the entire house. An ancient belief had it that forces of evil would dwell in all things left dirty on that day. If the first person to enter a house on Christmas Eve was a woman, it was a bad omen, meaning that only heifers would be born in the farm in the coming year. It was a good sign when a man was the first to cross the threshold of the house. Until recently, harvest fortune-telling was very popular in the countryside. After supper, the host would go out to the garden, carrying dried fruit. He would throw it on the trees, shouting "Apples, pears, plums, cherries, and all the leaves in the neighbor's yard." He would take a handful of straw and twist it into a rope. Grabbing an ax with other hand, he would approach a tree and threaten it by saying, "I'll cut you down!" His wife would cry, "Don't cut it, it will bear fruit!" Then she would tie the straw rope around the tree. This bizarre little pantomime apparently brought a good harvest. Today, few people are familiar with Christmas Eve fortune telling, especially urban dwellers. Yet some old traditions can still be found among village people who tend to lead a more old-fashioned lifestyle, closely connected to nature and its cycles of death and rebirth. The modern Christmas tree as we know it today came to Poland from Western Europe towards the end of the 18th century. Initially popular only in town, it gained popularity with peasants at the end of the 19th century, The first Christmas trees were decorated with apples, nuts, gingerbread, miniature loaves of bread and many colorful candles. In modern-day Polish homes, both in town and village, Christmas trees are decorated with factory-made colorful glass balls, ribbons and tinsel. But on many trees, these decorations are accompanied by the old-style traditional home-made ornaments which have been handed down from generation to generation. Under the Christmas tree presents are laid for family members and friends. These are wrapped in colored paper and decorated with tinsel and bows. Presents are exchanged and opened after the Christmas eve supper. The traditional Christmas Eve supper consists of twelve dishes representing the twelve months of the year. No meat is served during the supper, only fish, usually herring, carp or pike. Other traditional dishes appearing on the table include red borscht, mushroom or fish soup, sauerkraut with wild mushrooms or peas, dried fruit compote and kutia, a dessert especially popular in eastern Poland. Boiled or fried pierogies, Polish dumplings with a wide variety of fillings, are among the most popular Polish dishes. For the Christmas Eve supper, pierogies are usually made with sauerkraut and mushrooms. This recipe is the first of the 12 dishes that make up the traditional Polish Christmas-eve meal, which is eaten after sundown on Christmas Eve. The Polish word for "Christmas eve" is Wigilia (pronounced VI-gee-lee-ah). Its root is like the English "vigil": waiting for Christ to be born. At the end of the Wigilia meal the family goes off to midnight mass at church. There are usually 12 dishes in a Wigilia meal to symbolize the 12 apostles, though some families serve 13 because they include Christ in their count. The meal starts when the first star can be seen; this symbolizes the star of Bethlehem. Although The Wigilia is meatless (Advent, the season of penance, continues until midnight), it is still festive and delicious. 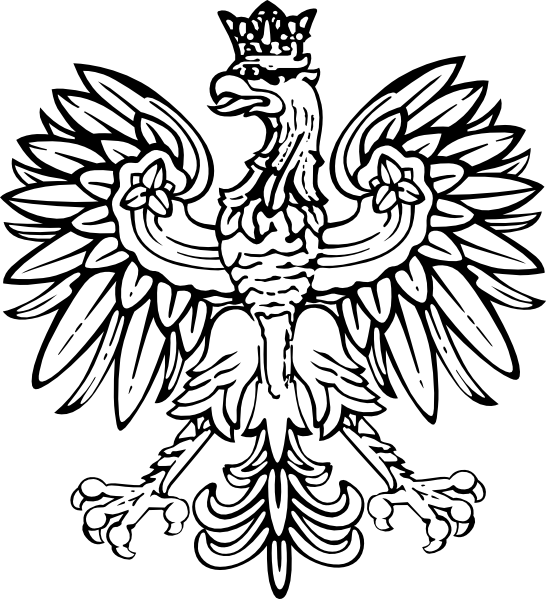 The tradition of Wigilia, though centuries old, is still current in Poland. There is no fixed set of rules for what the 12 (or 13) dishes must be; the items in the meal change somewhat according to location and availability of ingredients. Nevertheless, all of the dishes are traditional, and in addition there are many traditions for the serving of the meal. For example, some people place straw under the tablecloth to symbolize the manger in which Christ was born. Most families set an extra place, for the stranger who might be passing by. Wesolych Swiat! Bozego Narodzenia! That is the way to say "Merry Christmas" in Polish. Among Poles, wherever they are, the most beloved and beautiful of all traditional festivities is that of Christmas Eve. It is then that the Wigilia, or Christmas Eve Dinner is served. It is a solemnly celebrated occasion and arouses deep feelings of kinship among family members. Wigilia or Wilia, from the Latin word vigilare - to watch, Czuwac in Polish, is reverently close to the heart of a Pole. It is greeted with such mystical symbolism, that it is considered by many to be a greater holiday than Christmas itself. The very word Wigilia, which in Poland was formerly known as the day before a feast day is now used only as the day before Christ's birth. The Wigilia supper is so special there is no other like it throughout the year. The day itself had significance many centuries before Christ's birth. Since it followed the longest night and the shortest day it was considered the last day of the year and the mystical symbolism associated with it was closely tied to the solar system. The severe cold weather and deep snows made families hold their festivities near the hearth within family groups. This day became known for generations to come as the holiday which strengthened family ties. Some customs varied at different sections of Poland, but the importance of the holiday was general in the whole country. Another custom arising from the past, was the belief that spirits pervaded the home on this day. Everything was to be made as comfortable as possible for them and that this last day of the year would prophesize everything that was to happen in the coming year. From very early on, everyone was careful of conduct and observed everything that occurred in the house, garden and heavens. The rules were to rise early, say your prayers earnestly and carefully, wash thoroughly, dress cleanly, and then peacefully and patiently attend to your work. The first preparation for Christmas Eve began very early, right after midnight that morning. One of the young girls of the family went to the nearest stream and brought back pails of water. The water was used to sprinkle the cows in barn and also sprinkled on the family, awakening them in this manner. It was believed that water on this day had the power to heal and prevent illness. The entire family washed themselves in this water in order to assure plenty of money for the rest of their lives. It was the responsibility of the males to go into the forest and bring back boughs of fir and spruce to decorate the house on this special day. Everyone hurried to be first to cut the top of a spruce or fir and other branches. The top of the spruce or pine was hung from a beam in the ceiling, with the tip facing down over the table where the Wigilia was to be held. In preparation of this most important meal of the year, the table was first covered with straw or hay, and then with a white tablecloth. There is always a thin layer of hay under the white tablecloth in memory of the Godchild in the manger. 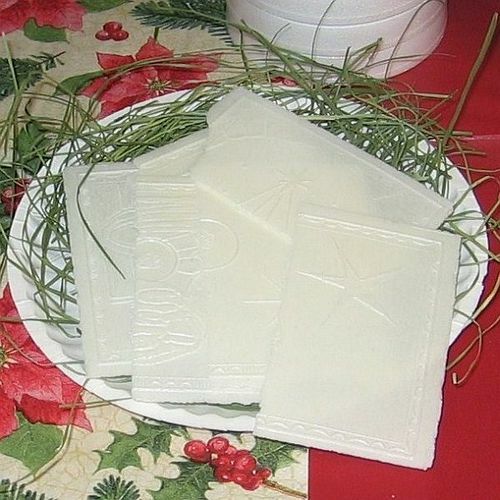 On the best plate of the house, the blessed wafer or Oplatek (Christmas wafer) was placed. The Oplatek is a thin, unleavened wafer similar to the altar bread in the Roman Catholic Church. It is stamped with the figures of the Godchild, the blessed Mary, and the holy angels. The wafer is known as the bread of love and is often sent by mail to the absent members of the family. It is believed that those sitting down to eat dinner must add up to an even number. An odd number foretold that someone would not live to the next Christmas Eve supper. To make up for this, someone was always invited to make up the deficiency, be it honored guest or wandering beggar. Also, tradition dictates that the dinner itself differs from other evening meals in that the number of courses is fixed at eleven or thirteen dishes, with 13 being the preferred number as it represented the number that sat down at the Last Supper. The Wigilia is a meatless meal, no doubt the result of a long-time Church mandate that a strict fast and abstinence be observed on this day before Christmas. Although the Church laws have been revised and permit meat to be eaten on this day, the traditional meal remains meatless. 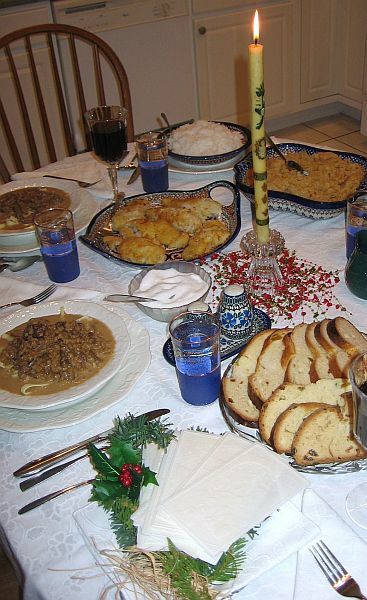 Items that would normally be included in a traditional Wigilia menu include mushroom soup (kwasufka), boiled potatoes (kartofle), pickled herring (sledzie), Polish Noodles with Poppyseeds (Kluski z makiem i), pierogies, Baked apples with red wine (Jablka na winie czerwonym), a dried fruit compote, Polish bread (babka), bread w/honey & poppyseed (babalki), Polish bowtie pastries (Chruscik - "Angel wings"), cabbage and noodles (Kluski z Kapusta), meatless cabbage rolls (Golabki), assorted pastries, nuts and candies. A lighted candle in the windows symbolizes the hope that the Godchild, in the form of a stranger, may come to share the Wigilia and an extra place is set at the table for the unexpected guest. This belief stems from the ancient Polish adage, "A guest in the home is God in the home." As the day began to darken and family members began to ready themselves for the evening meal, a child was sent out to look for the first star in the sky. With the appearance of the first star, the Wigilia meal would begin. Before approaching the Wigilia table, the family knelt down on the floor and prayed together out loud, grateful for all the blessings of the past year. At the conclusion of the prayer, the most important ceremony of the night, sharing of the Oplatek, and the exchange of wishes began. Before sitting down at the table, everyone breaks the traditional wafer, or Oplatek and exchanges good wishes for health, wealth and happiness in the New Year. This is such a deeply moving moment that often tears of love and joy are evoked from the family members who are breaking this symbolic bread. After the meal the members of the family sing Polish Christmas Carols called the koledy while the children wait impatiently around the Christmas tree or choinka for the gifts to be exchanged. Polish Christmas Carols or koledy are numerous and beautiful, especially when sung in Polish parishes at the Christmas Eve Mass. This Mass is called the Pasterka, which means the Shepherds Watch, and there is popular belief in Poland that while the congregation is praying, peace descends on the snow-clad, sleeping earth and that during that holy night, the humble companions of men - the domestic animals - assume voices. But only the innocent of heart may hear them. Christmas Day itself is spent in rest, prayer, and visits to various members of the family. Boze Narodzenia, Christmas Day, was considered so important a holiday that menial work of any kind was not even thought of. This day was spent in comparative quiet surroundings within the intimate family group. Christmas day had its traditional menu, but there was no special number of courses. Ham and Polish sausage were very popular, since pork had always been eaten at special festivities. The old Polish literature testifies that Bigos, hunters stew, was often used as the principal dish on Christmas Day. Cooking included only the heating of previously prepared food. Christmas day was the beginning of the twelve-day period from Christmas which was called "Gody " These twelve days were observed very carefully, for it was believed among the Polish people that Christmas Day and each of the following eleven days foretold the weather for the equivalent month of the year. The nights were also part of the prognostication. If the day was fair but it rained or snowed during the night, then it foretold that the first half of the month would be fair but the second half would be damp. The second day of the Christmas season (December 26) was St. Stephan's Day, the traditional day of visiting and wishing everyone the joy of the holiday season, a direct contrast to Christmas Day. St. Stephan's Day marked the end of work contracts for the year; new bargains were struck for the upcoming year. It was also the official day for caroling to begin. The custom of caroling in Poland, or Chodzenie Po Koledzie, began on St. Stephan's and lasted until the Feast of the Purification on February 2.